Cocoa butter has long since been my favourite body moisturizer. It is so rich and creamy and conditions skin so well that it stays smooth all day. Creams and lotions containing cocoa butter are really nourishing, but I find the actual concentrated formula much more effective in treating stretch marks, discolourations and dryness without any added synthetic ingredients. For those of you that aren't convinced, here is the know how (know what I should say!) of cocoa butter! Pregnant women have long used to cocoa butter formulations to prevent and treat stretch marks, but this pleasant-smelling substance is added to countless other topical preparations as well. 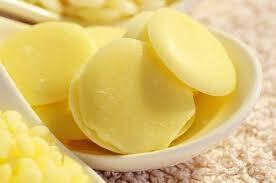 Lotions and oils containing cocoa butter are often used in aromatherapy massages to promote feelings of relaxation and well-being. Recent research indicates that massaging the skin with cocoa butter may help relieve stress, boost the immune system, and even prevent cancer. This is because cocoa butter, like chocolate, contains a lot of CMP. Researchers in Japan reported that CMP inhibits the growth of cancerous cells and tumors by reducing active oxygen levels in the body, and concluded that CMP inhibits the oxidation of LDL (good) cholesterol and the production of inflammatory cells; there is some evidence that the CMP in cocoa butter may also help prevent heart disease and ease arthritic symptoms. Preliminary research indicates that CMP actually helps suppress excessive T-cell activity in the immune system, which could help treat conditions associated with overactive immune systems, such as psoriasis, fibromyalgia, and chronic fatigue syndrome. Cocoa butter is found in chocolate of course, and as previously stated, is an ingredient in countless topical preparations. You can also buy pure cocoa butter at pharmacies, health food stores, and from online distributorships. There have been rare cases of sensitive individuals having skin reactions to this substance. If you notice any rash or discomfort, simply discontinue use of this product.